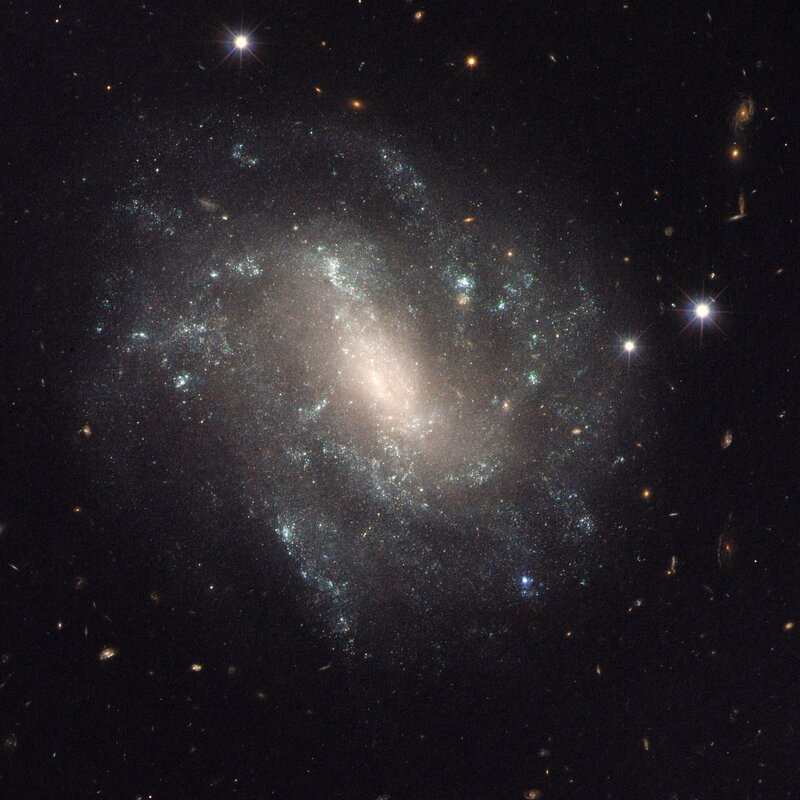 A team of astronomers, led by Nobel Laureate Adam Riess and using the NASA/ESA Hubble Space Telescope, have discovered that the Universe is expanding between five and nine percent faster than previously calculated. This is in clear discrepancy with the rate predicted from measurements of the infant Universe. “This surprising finding may be an important clue to understanding those mysterious parts of the Universe that make up 95 percent of everything and don’t emit light, such as dark energy, dark matter, and dark radiation,” explains Adam Riess of the Space Telescope Science Institute and the Johns Hopkins University, both in Baltimore, USA. The team made the discovery by refining the measurement of how fast the Universe is expanding, a value called the Hubble constant, to unprecedented accuracy, reducing the uncertainty to only 2.4 percent . This new measurement presents a puzzle because it does not agree with the expansion rate found by looking at the moments shortly after the Big Bang. Measurements of the afterglow from the Big Bang from NASA’s Wilkinson Microwave Anisotropy Probe (WMAP) and the European Space Agency’s Planck satellite mission yield smaller predictions for the Hubble constant. The team is continuing to use Hubble with the aim of reducing the uncertainty in the Hubble constant even further, their goal being to reach an uncertainty of just 1 percent. Current telescopes such as the European Space Agency’s Gaia satellite, and future telescopes such as the NASA/ESA/CSA James Webb Space Telescope (JWST) and the European Extremely Large Telescope (E-ELT) could also help astronomers make better measurements of the expansion rate and lead to a better understanding of our Universe and the laws that govern it. Before Hubble was launched in 1990, estimates of the Hubble constant varied by a factor of two. 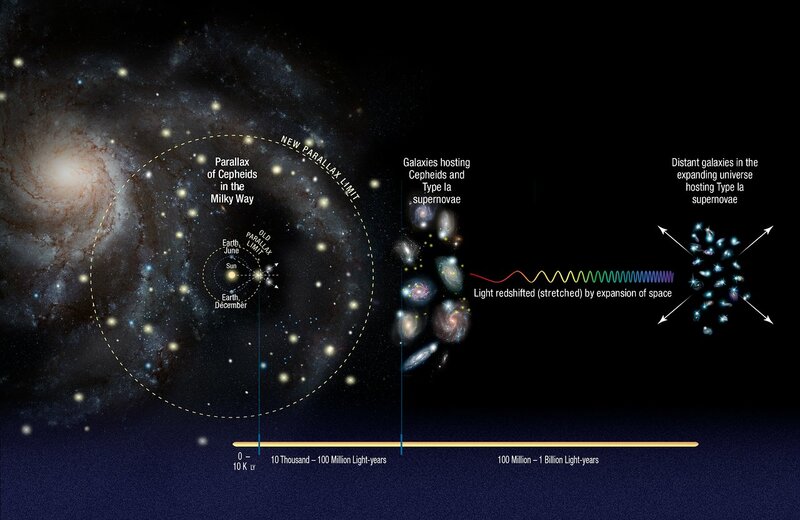 In the late 1990s the Hubble Space Telescope Key Project on the Extragalactic Distance Scale refined the value of the Hubble constant to within 10 percent, accomplishing one of the telescope’s key goals. The new, improved Hubble constant value is 73.02 kilometres per second per Megaparsec (where one Megaparsec is equivalent to 3.26 million light-years).